After a few weeks of preparations, today was finally the day to print the editions that we were hired to do. I had everything ready to go when Molly arrived at the scheduled time. It's been a long time since I used a press to print a relief print, not since I was in grad school. 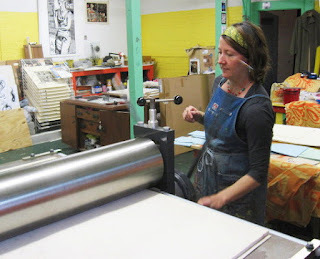 (the print I had done at Evil Prints in St Louis was done on a press, but Tom's studio assistant did all the work) However I've worked with presses enough in the past to know a thing or two, and we had Molly, owner of the press, to handle all the details. The first step for each print was to adjust the press for the thickness of the block. (all three, one double sided, were different) Once we found the proper pressure, I took the block over to my area and started inking. The first few proofs of each always took longer, but the process would get faster as the ink built up, though not so much ink built up that there was a noticeable difference between first and last proofs. 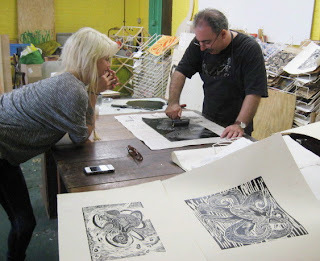 The next step was to take the inked block over to press, and that's where Molly took over. I had taped to the press bed a paper template with registration marks for the paper and a marked box for the block, so that all prints would be centered on the paper. Molly used her much cleaner hands to carefully place the paper in its proper spot. After that, Molly and I would put the blankets in place and she would crank the block and paper through the press. The blankets were then rolled up and the print carefully lifted from the block. After a quick inspection to make sure that it was up to standards, it was placed in one of the drying racks. At the end of the day's work, we had finished the commissioned work- editions of 7 prints each of the four blocks. 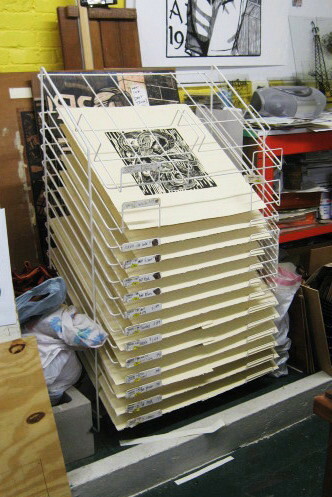 After a few days they'll be dry enough to be signed and safely transported home by the artist. I've done the equivalent of printing that number and size prints by hand by myself, though that only happens when I'm producing an edition for a group folio. And I would typically break that up into two sessions to keep my arm from falling off. 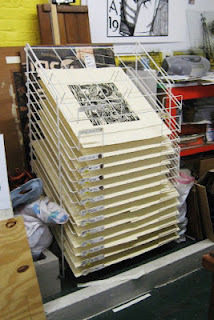 The division of labor and use of the press does make the job a lot easier. Too bad I don't have the money to hire a staff for my own projects. Been busy with various projects of late, which has kept me from making any new art the past few weeks. That should change soon, and activities today should help bring that around. In the early afternoon I drove up to the Studio with a list of things to work on. The printmaking supplies that I had ordered for the editioning job arrived at the Jersey Shore yesterday, and I opened them up at home to make sure everything arrived in good shape. It did. I brought those with me today, getting there in time to meet with Ashley regarding her editions. She dropped off the blocks and answered a few last specific questions about the job. After she was gone, I spent some time tearing some of the paper down into different sizes appropriate to her 4 prints. 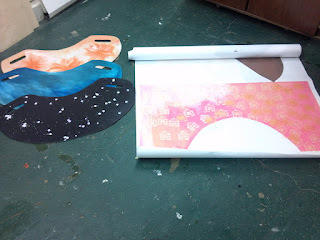 I also created some press bed templates- large paper with marked out borders for the paper and the centered block. 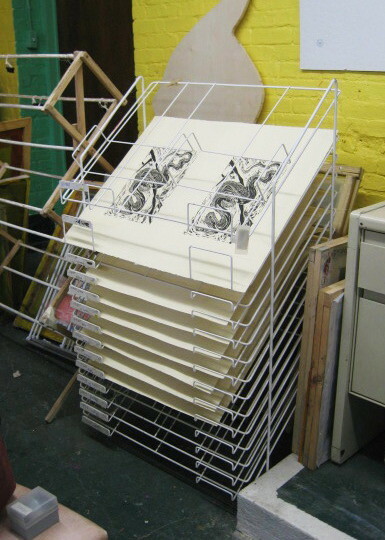 These will make sure that the margins are identical on all the prints in each edition. I packed it all up in preparation for tomorrow's planned print session. None of this was exciting enough to take pictures of, but I expect to get some photos of the printing process. 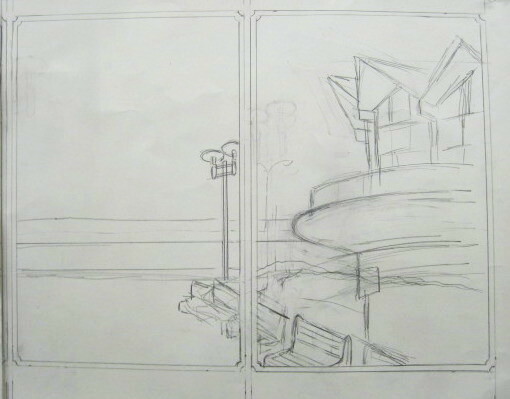 My next planned print is the latest in the boardwalk series, which right now looks to me the four panel double diptych set on Asbury's boardwalk. I need to check out those buildings one more time, and had considered doing that while I was up that way. However, the pleasant sunny weather at my apartment turned to gusty winds in Ocean Grove, and I knew things would be worse up by the ocean, so I put that off. Had a backup plan. A month from now I am scheduled to do an appearance at a meeting of the Freehold Art Society- show some art, and demonstrate cutting and printing. There's no way that any boardwalk block would be ready enough to start cutting by then, so the simplest solution is to do what I did for my last such appearance, start a new saint. There were a lot of hassles connected to my move last year, but one benefit is that sorting through everything I own turned up some useful things I hadn't seen in a while and I have been able to put them in places where I can find them again. One of those things was a notebook I was using in my last year of grad school, where I took notes for my Everyman series. Back in 1994-5 as I was reading the Butler's book I noted possible ideas, the best of which became woodcuts. I had to cut off the process as I got close to the date of the MFA show, leaving me light on saints with feast days from January to June. In my notebook I had one line summaries of dozens of saints from those months, easier than reading through 1400 pages of biographies again. When Ashley had notified me that she might be late, and I wasn't sure how long I'd have to wait around, I grabbed those first two Butler's volumes so I could follow up on those noted saints. Spent about an hour going through some possibilities. Over the next week I'll pick one and start sketching some ideas. Molly showed up to do some work of her own while I was still proofing Ashley's blocks, and continued to work well after my business meeting was done. We were long overdue for a pizza and beer event, so we went across the street to get some to bring back to the Studio. While we were enjoying that, I finally had a chance to ask Molly about something I had wondered since last spring. The two of us have had somewhat parallel lives- around the same age, we both earned undergraduate degrees as out of state students in Virginia state colleges, and both got our MFA's in printmaking at larger midwestern universities. Last spring I wrote about the question I was often asked in Virginia, about my not going to VCU to study art. So today I put the question to her. Turned out to be more or less the same thing as my experience- not being from Virginia she had no idea that VCU was the big art school, but instead chose a liberal arts school known for providing good value for the money. The one difference is that she expected to study art from the beginning, while I only came to that decision almost halfway to my BA. She said it was important to her to go to a regular college and not an art school, which she thought would limit her education in all things not art. That led to me sharing some information I had read the other day, in the NY Times education supplement. The department of education tracks college costs, and produces a list of most and least expensive colleges, with a net price accounting for stated tuition, living and school expenses, and typically offered scholarships and grants. What surprised me is that the top of the expensive list is dominated by art schools. Top 5: Art Institute of Chicago (average net price over $41,000), RISD (about $39,000), The New School (Parsons seems to be it's biggest division, about $38,000), Art Center College of Design- CA ($38,000), and Ringling College of Art and Design ($37,000). Pratt slots in at #8, and there are three more in the top 25. While I'm sure that all these schools have facilities far better than any of the public colleges Molly and I attended, and a list of impressive alumni, I find it astounding that anyone would pay almost $40K per year to earn an art degree. An education at a top school for medicine, law, or business can also be quite expensive, but those who do well have a reasonable shot at a job that will allow them to pay back those costs. If there's one group of people who should not be racking up huge student debts, it's artists. I do encourage anyone interested in art to study it, at least part time if not full time, but I would warn anyone against committing those kind of resources to a degree that has such dismal prospects for a career. Back when Molly and I started the Studio six years ago, the primary purpose was to have a place for us to work on our art. 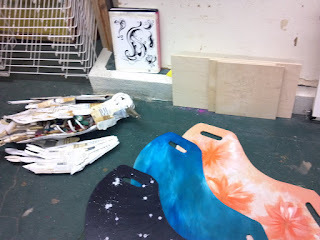 We also assumed that we would teach some classes and use the space to do art/printmaking work for others. We both have done commissioned work and held classes, and a few print artists have rented the space for the purpose of printing editions of their work. A new variation of that came our way recently. I was contacted by e-mail (someone who saw my class listing on the BAC website and tracked me down) with a request to print an edition of her block. 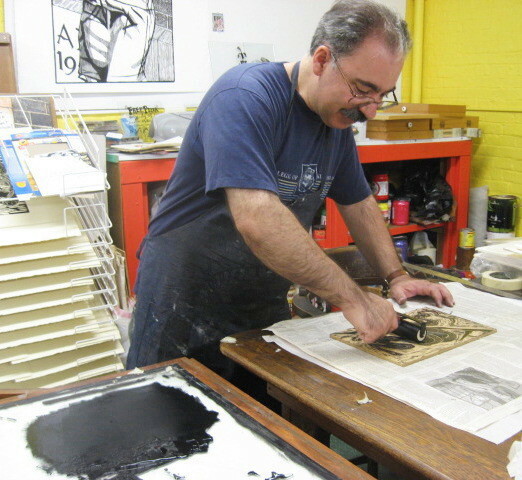 This was a type of job that I had always considered a possibility, since it is a function of the big print studios. So after a few e-mails, I met briefly with Ashley last weekend to see the blocks and discuss some details. She has four cut blocks, three of which had never been proofed. She wants to have the prints in a show coming up next month, but for various reasons is unable to print them herself right now. At Saturday's meeting I learned the size of the blocks and we discussed edition size, paper, and prices for the work. I ordered the materials, which should arrive sometime in the next week. However, it's hard to pull an edition if you don't know what the print is actually supposed to look like. So I acquired a few sheets of a paper similar in size and color to what I ordered, and had Ashley bring the blocks back in today to be proofed under her supervision. For the three wood blocks (never inked) I pulled an initial proof on inexpensive drawing paper, then re-inked and pulled them on the print paper. 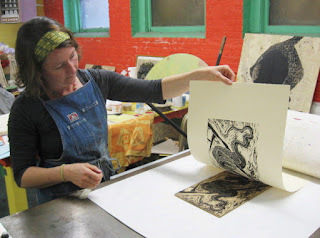 It was the first time the artist saw the prints, and she was pleased with how they turned out. 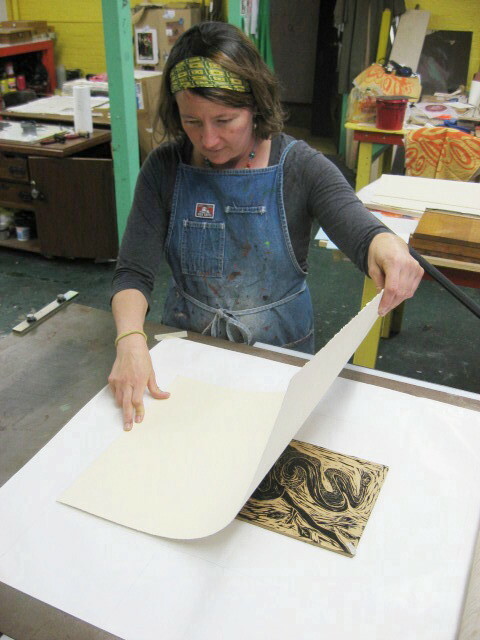 (this was also the first time she ever saw anyone hand print a block, or even heard of the process) The fourth print was the largest, and cut into a rubber printing block, a relatively recent development in the world of relief printing. (soft, easy to cut, popular especially for school students) This one was much more difficult to hand print, perhaps because the material is so soft. When we do the actual edition we'll use the press, but for today I was able to pull some good proofs (below) the old fashioned way. Ashley took the blocks home (she may cut away some bits that accidentally picked up ink in the proofing), but left our finished proofs behind. These will serve as the guide for when the print the actual edition, sometime after the paper arrives. 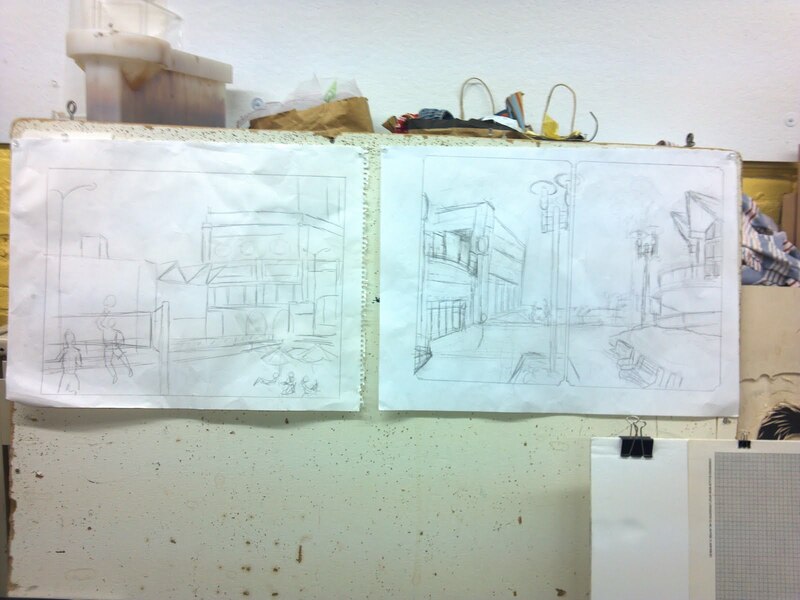 Today I went into the Studio to explore this recent idea of expanding the Asbury daytime scene to a double diptych. I cut a big piece of Strathmore drawing paper from a 10 yd roll I had purchased last year (in case I wanted to use it to proof the large smoking block) and marked it with four 15" x 10" panels. Then I started drawing. 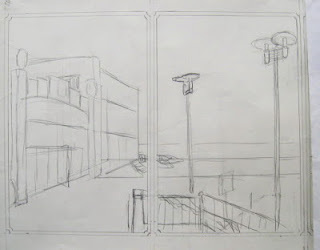 I used the versions of the two buildings from the first pencil sketch, putting them at either end. For the space in between, I combined aspects of that sketch and my reference photos from the scene. It's just a very rough sketch, but it gives the general idea. Molly was also working there today, and she definitely preferred this version, assuming that expected elements are added to various parts of the composition. Another thing to consider is how this image would break down into individual diptychs, should there be a need to exhibit it that way. So above and below are each half by itself. If I decide to do this, I think it would be best to have it all as one piece of wood. That means I'd have to buy some new wood, a full 8' x 4' sheet so I could have a 4' wide section of vertical grain to work with. I'm guessing that it has something to do with our rescheduling this month's critique group meeting (maybe people forgot to mark the change on their calendar, or maybe it's related to the holiday), but tonight we had one of our smallest attendances that we've had in years. Seven artists showed up, with five actually bringing art (though the others brought food and beer and opinions, all of which are very welcome in our crowd), so we could have a little more time to spend on each artist. This was also the first time in a very long time that I didn't remember to bring my camera with me, so we are relying on some camera photos from Molly to document tonight's art. Up top we see Lisa's dead sea bird sculpture, Molly's ink doodle drawings, and some early wood block sketches and colorful painted lap trays from Mary. Below are the trays again, and Molly's large drawing in progress. 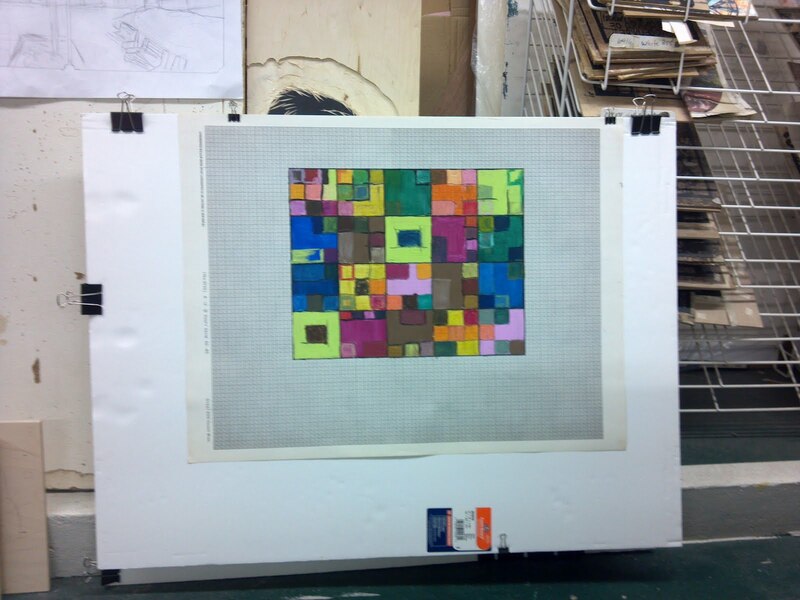 Vince brought another one of his colorful grid drawings (above), this one in progress. I originally put up the second version of my latest boardwalk idea (below), but with nothing else to go up on the tack board, I put the first version up next to it so we could compare the two. I presented the pair, told the story of how I ended up finding the second view (on the right), and stating why I was leaning in that direction. Not everyone necessarily agreed. 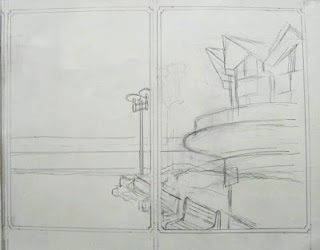 Some saw more possibilities in the composition of the one on the left, but for me it makes the boardwalk itself too small and overemphasizes the iconic buildings in the background. The one on the right includes a foreground that can include a wider variety of boardwalk characters. Some people thought that the new version was a bit claustrophobic, with the buildings pressing in on both sides, and the large central street light adding to the crowded feeling. That is something that has concerned me, since I had to cut a big chunk of the space that really is there so that I could fit the two buildings into my format. Then Molly had an interesting suggestion. Maybe it was seeing the two diptychs side by side, but she brought up the possibility of doing the scene as a double diptych (four panels), with one containing Convention Hall and empty space, moving the big central lamppost well over into the right panel, and the second having the open boardwalk in the left panel and the former Howard Johnson's building at the right of the right panel. This would be a deviation from the standard for the series, but there are precedents in ukiyo-e of 3 or more panel groupings. They could still be presented/framed as two individual diptychs, though it wouldn't be too large to also print and frame as one piece. And it would restore the proper proportions to the scene and give me that much more space for people. I don't know that I will do this, but it's worth sketching out to see how it would look. Since we finished so early tonight, we had time to relax around the refreshment table and discuss the possibilities of a group show for our critique group. We are very diverse in medium, style, and level of experience, but a lot of good work has hung in this space over the past 4.5 years, and we could put together a very interesting show. If something comes from it, I'll post it here. This past weekend the art world lost a very polarizing figure- Thomas Kinkade. In terms of sales, probably by far the most successful American artist of the past few decades. Yet no serious critic would ever review his work, no major museum would ever show it or collect it, and no art history textbook will ever include his work. Kinkade was a mass producer of kitsch. Hypercolored paintings of bucolic scenes- think of a quaint cottage in the woods beside a stream, with patches of blooming shrubs and wildflowers spread around. He trademarked for himself the title "Painter of Light", which he claimed had a religious connotation in his paintings. (not exactly a new idea for anyone with minimal knowledge of Baroque art- see Caravaggio, Rembrandt, Vermeer, etc). If he was doing all this in the early 1800's, he probably would have fit in well with the Romantic landscape painters of the era. Kinkade claimed to be a devout Christian and saw his art as an expression of that. Let's say I take him at his word, and believe that his paintings were true examples of self expression of his personal vision. If he had just spent the past few decades turning out his canvases, displaying them in local galleries, and selling them to people who liked that kind of thing, I'd wish him well with a market I have no interest in pursuing. No fellow artist would begrudge him that. But Kinkade made product, not art. His paintings were reproduced as printed canvases and mass produced posters, which were sold in huge quantities to his gullible fans as genuine fine art at genuine art prices. At his height of success, there was a chain of hundreds of dedicated galleries selling his reproduced "art", along with any other object on which the images could be printed. (this is in addition to thousands of other stores that carried his products as well) His designs were licensed for everything from furniture fabrics, to a whole housing development, plus greeting cards, calendars, and uncountable other "collectibles". There were many examples of customers who had invested six figures in their Kinkade collections. But even then, there were problems. Many of those dedicated galleries failed, with lawsuits following from franchise owners who claimed they were lied to about the business and forced to take on unsalable inventory. And yet Kinkade regularly saw annual revenues over $100 million. Some super rich art collector spends millions on a contemporary piece of fine art and I believe that they are getting ripped off. However, such people have the millions to spare and one assumes some knowledge of the world of fine art, and if it blows up on them, they'll survive. However most of Kinkade's collectors were not wealthy or art knowledgeable. I saw interviews where his fans were proud of not understanding high art, preferring Kinkade's work because it was pretty and didn't require them to think anything beyond that. I saw an interview in which Kinkade put himself above Picasso, describing the other as a hack who cranked out 10 Picasso's before breakfast to make money. It's true that late in life Picasso was not above producing product, but the work that made his reputation decades earlier was done in spite of its lack of commercial appeal at the time. But how did Kinkade not see himself as just as much a commercial hack, if not worse? Or would he just never admit it to those he was counting on to buy all his licensed art, people who probably couldn't afford the loss? I think that's why the art world has so little respect for Thomas Kinkade. Not because of his subject and style (which would be just as valid in today's crazy art world as anything else), but because his business was making money, much of it by misleading his fans as to the real value of his product. I'm curious to see what his status will be ten years from now. 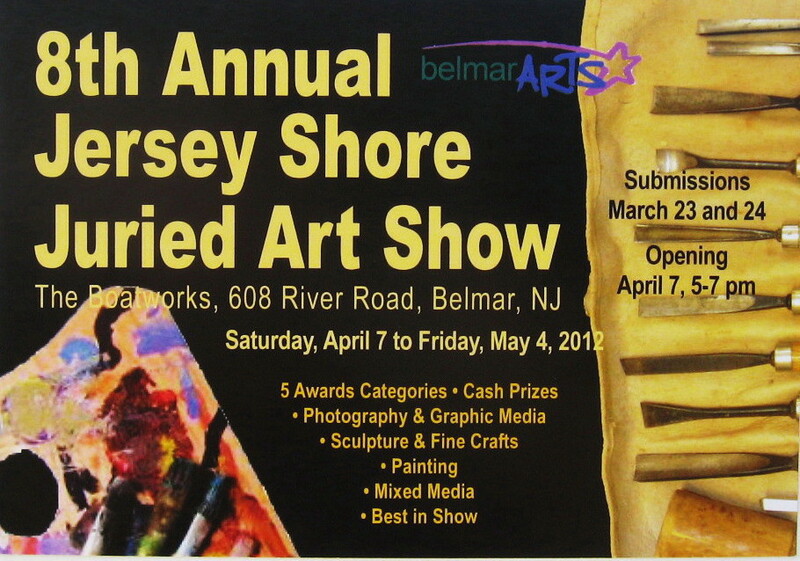 Today was the opening reception for the Belmar Arts Council's 8th Annual Jersey Shore Juried Art Show at the Boatworks. I originally joined the BAC by entering the 2nd Annual Show in 2006, and have been in all of them since. I never take this for granted, because juror decisions are completely subjective, but so far my luck has held. 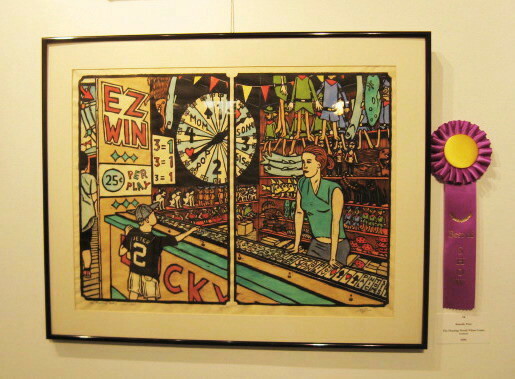 Back in 2007 (3rd Annual) I was awarded the Best In Show for my large woodcut Employee. I've won several other awards at the BAC over the years- category wins, honorable mentions, another best in show in a smaller show, even a 2nd prize for pumpkin carving. I suspected a few days ago that I had won another award for this show (during a stop at the Boatworks I had noticed some post-it notes stuck to my piece, but didn't go over to read them) and then yesterday I got an e-mail confirming there was an award, I guess to make sure I'd show up. When I got there just before 5 pm, I leaned officially that I did get an award, once again the Best In Show for the big annual exhibition. That's two of those in six years. In both years, the outside jurors who were brought in to judge the show were painters known for large detailed realistic works. I had no contact with either juror before or since, but I'm guessing that each reacted to the level of detail (both in technique and ideas) in my prints, and maybe the perceived difficulty of carving it all into wood. At least that's what everyone I spoke to at the reception was impressed by. And the relative rarity of my medium certainly makes me stand out in this crowd of mostly painters. Considering how often my work has won awards around there, you'd think that everyone would be thinking about doing some woodcut prints of their own. Anyway, that's what I'm hoping, since I will be scheduling a new series of woodcut classes there in Belmar for early in the summer. The timing is meant to coincide with a demo I'm doing for another regional arts group, but having this prize winning piece up on the walls of our building for another month couldn't hurt. 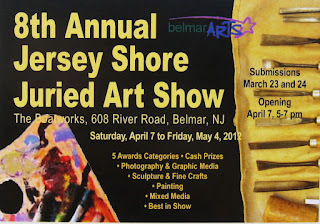 The show, which has many other fine artworks in it, will be on display during gallery hours (Wednesday to Saturday, 1 to 5 pm) through May 4, 2012. Had a lot of art related things keeping me busy the past few weeks. There were the two print workshops (well, one ended up being cancelled, but I still had to prepare for it, and the process of cancellation was an effort itself), printing season for my college classes, and preparing and photographing work to be submitted to some spring shows. 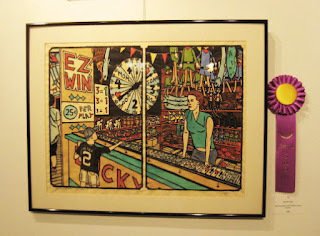 This morning I e-mailed in my entry for the annual members show at PCNJ. But that's all taken care of, so now it's back to making new art. The April critique got pushed back a week, so I may as well take advantage of the time to make something to show. The boardwalk daytime/Asbury scene is still at the top of my production list, so I'm picking up with that one again. I want to explore that view shown above, but there is one problem. 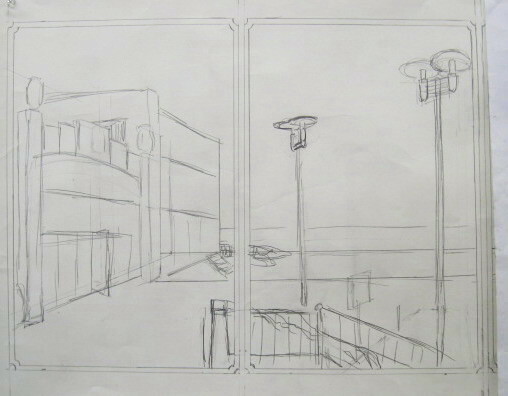 The ratio of the heights of the two buildings at either end to the width of the scene is about 1 : 3. The ratio of my standard format for these Floating World prints is more like 1 : 1.3. Part of the reason that all the boardwalk prints to this point have completely made up locations is that I'm often combining aspects of multiple locations. Part of that is because real locations don't always provide the ideal compositions. In recent days I did sketchbook drawings of many individual elements of the scene, based on my photos from a few weeks ago. Today was my first attempt to put it all together. Brought the sketchbook and a large sheet of paper to the Studio. Below is the result of today's drawing. 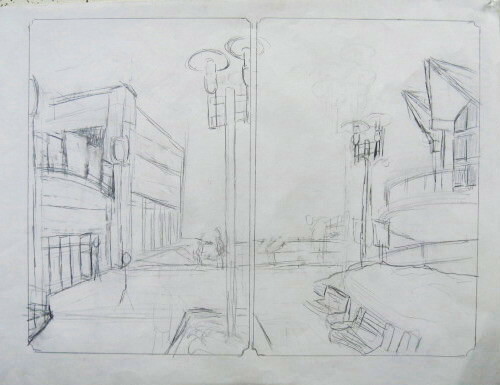 This is just a very early sketch, and I plan to fix up the details a bit more before the crit. And I'll need to go to the site again at least one more time to see the perspective again. But this gives an idea of how I might adapt the location to the format. I had to considerably shorten the space between the buildings, but the foreground space gives plenty of space for pedestrians (the benches in the lower right make up for ones lost by the boardwalk railing), and what remains should still read as Asbury for anyone who knows the place.